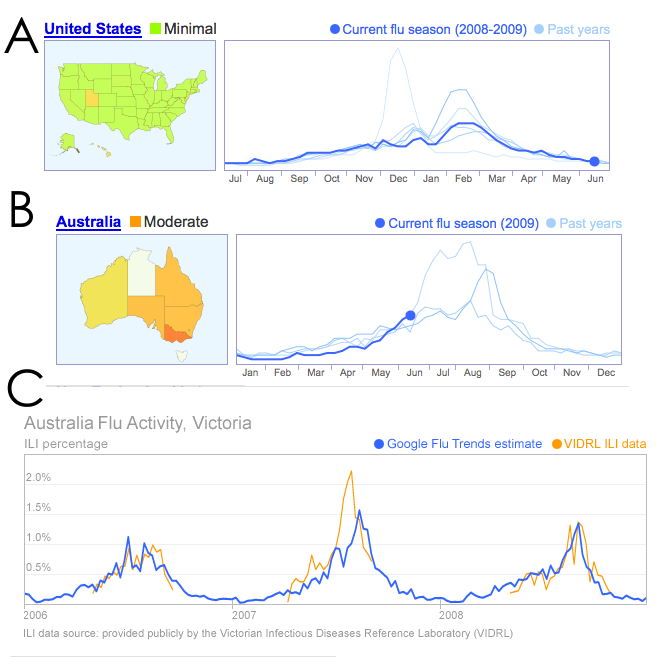 At the start of the month, Google announced it was expanding its search-engine-based epidemiology surveillance tool, Flu Trends, to process information originating from Australia and New Zealand (previously it was processing U.S. statistics and a beta Mexico version). The tool is based on there being a correlation between the number of people typing in influenza-related keywords into Google and the actual number of cases of influenza in the country. Google claims it is supported by historical data. The concept does make sense: when you are your family are sick with flu-like symptoms, that would be the time you are more likely to search for information on possible causes – Thus people searching for “flu” could reflect the cases across the country. But I was skeptical at how well it would work in a pandemic. Google’s data might hold up for its recorded history, but that does not extend back to 1968-9 – the last influenza pandemic. A pandemic not only involves the potential for an increased number of influenza cases and increased severity of those cases, it also means an increased amount of media coverage and public awareness. When I last looked at Google Trends and health searches, I saw a possible link between media coverage of Kylie Minogue and Australian searches for breast cancer. There is a good reason to suspect that the statistical relationship between search terms and disease cases will not hold up during pandemic conditions. This concern is not addressed appropriately in the Flu Trends FAQ. Looking at the U.S data, for this past season, it looks like it could be an accurate reflection. And if anything, rather than seeing a spike of search term activity this year, there was not much difference than previous years. In fact, the historic data contains several search spikes that do not exist in this years trends. All this information could either accurately reflect that the influenza pandemic thus far has been little more than out-of-season seasonal flu, or, just maybe, that the increased media activity and awareness have actually actively decreased usage of Google for health information. Were people being directly channeled towards non-search websites, like flupandemic.gov.au? Were they getting enough influenza information from other websites they frequent, like news websites? Was there enough offline influenza resources that people did not feel the need to Google to find out more? Or were people just overloaded and desensitized by the mass media hysteria? I still prefer the Rhiza Labs case-mapping tool. It is much more informative and accurate.